PROC SPP and other spatial analysis procedures in SAS/STAT are designed to handle projected coordinate systems, where the distance between two points can be computed using the Euclidean formula, . If your data are collected in a spherical coordinate system—for example, longitude and latitude—then you should convert it to a projected system before applying PROC SPP. This example walks you through a sequence of steps that demonstrate how to handle data that have spherical coordinates in order to analyze them by using PROC SPP. You are a geologist studying the relationship between the locations of earthquakes and the locations of geothermal activity in the western United States. You have earthquake data, courtesy of the United States Geological Service (USGS) and data about hot springs, courtesy of the National Oceanic and Atmospheric Administration (NOAA). You can view both of the data sets as spatial point patterns that are given in spherical coordinates. 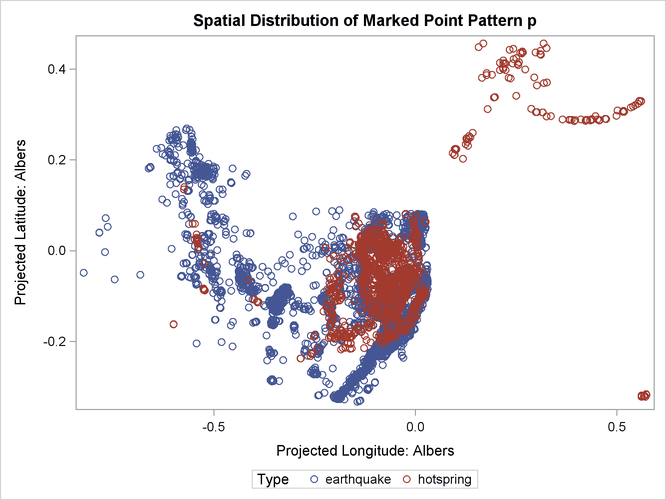 To explore whether the locations of hot springs and earthquakes are correlated, you first merge the two data sets into a single marked spatial point pattern, with a type variable to denote an earthquake, explosion, landslide, or hot spring, as shown in the following code. Figure 1 shows the locations of earthquakes, hot springs, landslides and explosions of different kinds. 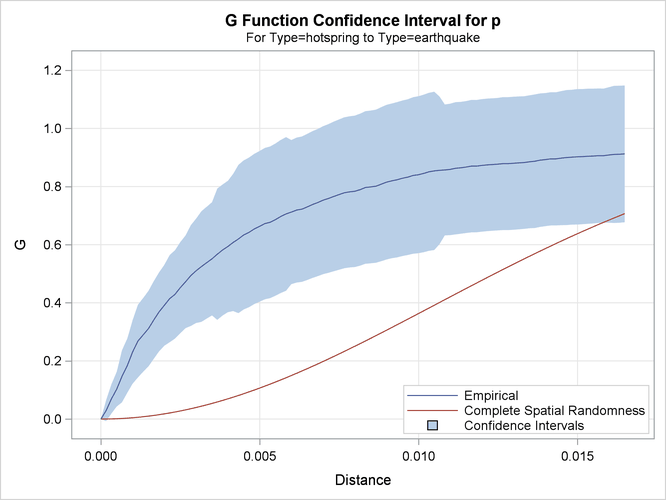 Figure 2 shows the plot of the edge-corrected cross G-function computed between earthquakes and hot springs. The blue line, which represents the empirical cross G-function, is far above the dashed red line. The confidence interval of the cross G-function is shown by the blue band around the blue line, also does not intersect with the dashed red line. This suggests that earthquakes are indeed clustered around hot spring locations.